New Santa Ana | Will the controversial Ed Heatley become the next SAUSD Superintendent? Heatley is a retired U.S. Marine Corp Master Sgt. who, when he was serving as the Superintendent in the Chino Valley Unified School District, wrote a memo in 2008, urging Chino Valley’s Board of Education to approve a resolution in support of Proposition 8, the measure to prohibit marriage equality in California, according to Berkeleyside. When the school board approved the closure of Gird, El Rancho and Los Serranos, the board was oblivious to the true reason behind the superintendent’s recommendation. It was not savings vs. cost but to improve Heatley’s chances to leave CVUSD. Heatley wanted three fewer PI schools on his resume. Three PI schools were eliminated but the English-learner students are our children, and they remained. In April of this year Heatley’s son, Anthony, 18, got busted for bringing a knife to school, in Georgia, just a few weeks from graduation. Anthony attends Jonesboro High School, according to WSBTV News. He also had a sometimes tenuous relationship with the media. It culminated in a May 2011 press conference where he blasted reporters for investigating rumors he was having an affair with an employee in the school system’s central office. 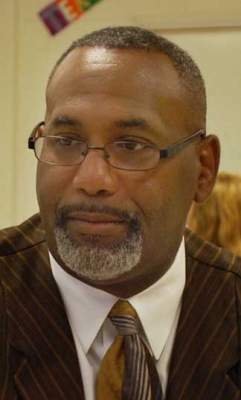 Heatley ran afoul of parents in July 2010, when he announced bus service was being cut to 4,600 students only a week before the school year began. He landed in hot water with parents again in July of this year when he announced a controversial shortened school day plan — less than a month before the current school year began — without first seeking public input. No matter how you slice it, picking Heatley to become the next SAUSD Superintendent seems like a very questionable move. Don’t do it Santa Ana! Ed Heatley almost destroyed Clayton County. His sidekick in Clayton was Stefanie Phillips who was recently hired as Deputy Superintendent of Santa Ana. They both came to Clayton from Chino Valley. The two of them leave devastation wherever they go. Google Heatley. It’s all true. He is a bully and is bad for children. Edmond Heatley and Stefanie Phillips together again will cause devastation once again to a 3rd school district. This ratchet duo came from Chino Valley and RAPED Clayton County School district. We are still in the recovery mode after the ruins Heatley left behind. He is a bully and a dictator. DON’T DO IT!!!! You will thank us later. For the two of them to go together from Chino to Clayton and then to Santa Ana is suspicious and definitely unwise. Residents should Google Heatley’s history. Human Resources became known as “Inhumane Resources.” Personally, I was in need of help from Human Resources, but was told by several people in the Department, that they were instructed not to help me, or they would lose their jobs. Checks and Balances within the district became extinct; people were given only the information that he wanted them to have. We all learned, “Don’t Make Waves” or you would be gone. Twelve people approached the local papers reporter, wanting to tell their stories of “horror,” but backed out at the last minute, since they needed their jobs. I was number Thirteen and I was already “squashed” and had nothing to lose. I had parents who were threatened with retaliation against their children, when they wanted to stand up with me. My personal friends within the district were intimidated and harassed, just because they were friends of mine. I had to push all my students, families, and friends, out of my life, to keep them safe. This may sound unbelievable to many, but my journey had taken its toll on my mental and physical health. Sounds ridiculous and is hard for even “me” to believe, but I have Post Traumatic Stress Disorder from not being protected against staff members and/or District personnel. I was not a soldier in the armed services, nor was I ever going to become one of Heatley’s “little soldiers. All my parents and kids respected me, just as I showed them respect. We made a 32 point gain on State Testing, while under my previous principal reign. We were actually frozen for the first of two years, due to the test results of our children. Towards the end my Principal changed the locks on the gates, so I couldn’t access my items. She then asked for my keys…low and behold, the very next day, the #15 key worked. They wanted me to gather my belongings on their terms, but I also was told I couldn’t be on campus. Finally, after being threatened with Ed. Code violations,, I was allowed one, eight hour weekend day, to remove all my belongings, but school security had to be there. I wasn’t quitting my job and I had two rooms to clean out, but when Ii opened the door to my library, I found that my fabric bulletin boards had been taken down and thrown on top of the trash can. When I addressed the Board of Education, regarding what transpired at my school, Heatley was conveniently absent, from the Board Meeting. The flow chart which shows the chain of command, was not in use. Heatley had formed his own Dictatorship, with him at the top and the Board of Education, below him. Yes, Heatley did push for a vote to close three schools, but it was so he would show three less PI schools. I couldn’t go on Disability, since I had my boss call me several times while driving on the way home. Again, he was begging me to not go on Disability or “It will look bad on him. Please do you research and find out the truth. It continues to amaze me that this evil man wreaked havoc in so many educator’s lives. Clayton was already in trouble when we brought Heatley in as our savior. He cam in with that big positive smile, I have an open door policy, speaking that education lingo with fluency. He pulled wool over all of our heads. 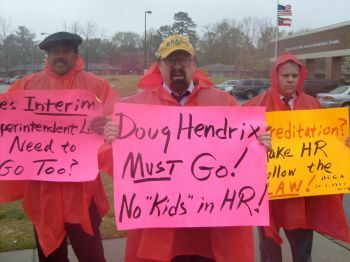 Edmond T. Heatly, Ed.D, is not an administrator nor educator. He is a little man with a Napoleanic complex. He’s been hired by numerous educational school agencies, he was never a teacher or educator who worked in the classroom. He’s hopped from one school district to another only leaving a trial of destruction for student’s, parent’s, teacher’s , school staff and Board Members. I was witnessed to one of his “I stand on your shoulders” speeches, only to later tell us all in a meeting why some of us would “not make it” after learning of the terrible budget deficit he orchestrated and was responsible for. He”s a small man, small minded bully who was probably bettered suited to remain a U.S Marine with his little soldiers he could manipulate and order around like little minions. Edmond T. Heatly must not remain in education. He is a racist, he cannot stand hispanics. He is a master of dividing people, not uniting them. I’ve seen firsthand what this so called professional educator can do to a school district and community. No one deserves the incompetence this little man and his followers bring to a school district.